This article is about the Christian Greek author. For the Athenian commander, see Aristides. For the Greek orator, see Aelius Aristides. Aristides the Athenian (also Saint Aristides or Marcianus Aristides; Greek: Ἀριστείδης Μαρκιανός) was a 2nd-century Christian Greek author who is primarily known as the author of the Apology of Aristides. His feast day is August 31 in Roman Catholicism and September 13 in Eastern Orthodoxy . In 1878, an Armenian fragment of an apology titled To Emperor Hadrian Caesar from the Athenian Philosopher Aristides was published by the Mechitarists of San Lazzaro in Venice from a 10th-century manuscript. The Armenian translation was accepted by most scholars as the long lost Apology of Aristides; however, a few did dispute its authenticity, most notably Ernest Renan. In 1889, the authenticity of the fragment was confirmed with the discovery of a complete Syriac translation of the Apology by British scholar Rendel Harris in the Monastery of St. Catherine on Mount Sinai. With this new discovery, J.A. Robinson was able to show Aristides's work had been in fact extant and edited in the religious book The Life of Barlaam and Josaphat since the 7th century. Another fragment of the Apology containing two portions of original text in Greek was published in 1922 by the British Museum on papyri. The Apology of Aristides is the oldest extant Christian apology since only a fragment of the older apology of Quadratus exists. "...they are wiser than the Barbarians but have erred even more than the Barbarians, in that they have introduced many gods that are made; and some of them they have represented as male and some of them as female; and in such a way that some of their gods were found to be adulterers and murderers, and jealous and envious, and angry and passionate, and murderers of fathers, and thieves and plunderers." In other words, Aristides is calling the Greek gods corrupt, immoral and guilty of being human. He concludes his chapters on the Greeks by commenting on the religious beliefs of the Egyptians, who he claims are the most ignorant people on earth since they did not accept the beliefs of the Greeks or Chaldeans and instead worshiped gods modeled after plants and animals. The Jews (chapter 14) are only commented on in a concise manner. Aristides commends them for their worship of God as the Creator and almighty but claims they have gone "astray" because "their service is to angels and not to God, in that they observe sabbaths and new moons and the passover and the great fast, and the fast, and circumcision, and cleanness of meats: which things not even thus have they perfectly observed." In chapters 15 and 16, Aristides describes the commandments of God and claims Christians "walk in all humility and kindness, and falsehood is not found among them, and they love one another." He explains "they ask from Him petitions which are proper for Him to give and for them to receive: and thus they accomplish the course of their lives." He concludes the Apology in chapter 17 by requesting the emperor to stop persecuting the Christians and convert to their faith; where he ends with a nice description of the Christian life. It has been suggested that Aristides is the author of the Epistle to Diognetus. This theory is supported by similar writing styles, descriptions of Christians, the treatment of Jews, as well as other similarities. Abbé H. Doulcet was primarily the leading voice of this theory in the late 19th century. The Epistle to Diognetus has been credited to Justin Martyr but without any sufficient evidence. Aristides is also credited with a sermon on Luke 23:43. Aristides is the second Greek Christian apologetic of the 2nd century. His writing style and thesis are very similar to the likes of Quadratus, Aristo of Pella, Justin Martyr and the author of the Epistle to Diognetus. 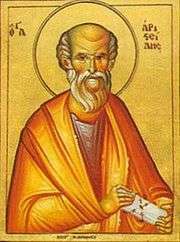 Jerome suggests Aristides's apology was the combined opinions of philosophers at the time and imitated by Justin Martyr afterwards. Negatively, Celsus used the Apology for his arguments against the Jews and "also certain features which he used in order to scoff at Providence." However, he was easily countered by Origen. The Apology of Aristides was later adapted into the work The Life of Barlaam and Josaphat during the 7th century. In the book, the Apology is told by a pagan philosopher by the name of Nachor, a character in the legend of Barlaam and Josaphat. The unknown use of the Apology in the book, allowed for the text to remain extant the entire time and influence Christian perception of Buddhism. Only with the rediscovery of the Apology in 1878 and 1889, did it reappear in history books. Rendel Harris, J.A. Robinson and few European scholars provided some commentary and studies of the text in the late 19th and early 20th centuries. There has been little revisionist history on the Apology of late, except for an article by G.C. O'Ceallaigh in 1958. He suggested the Apology was a Jewish work of the 2nd century and was then edited by a Christian writer in the 4th century to be a Christian apology. W. Fairweather, D.W. Palmer and Massey Hamilton Shepherd Jr. have used the Apology of Aristides, and other apologists' works, in order to support their theories on early Christian thought and Greek apologists of the 2nd century. 1 2 Cayré 1936, p. 111. 1 2 Jurgens 1970, p. 48. ↑ Quasten 1950, pp. 191–195. ↑ Milne 1923, p. 73. 1 2 3 Cayré 1936, p. 112. ↑ Harris 1891, p. 40. ↑ Harris 1891, pp. 41–50. ↑ Cayré 1936, p. 113. ↑ See Harris 1891 for a complete study of the Apology. ↑ O'Ceallaigh 1958, p. 227. ↑ Refer to Fairweather 1905, pp. 132–143, Palmer 1983, pp. 234–259 and Shepherd 1938, pp. 60–79 for more information on early Christian thought and second century Greek apologists. Carrington, Philip (1921). Christian Apologetics of the Second Century in their Relation to Medieval Thought. New York: The Macmillan Company. Cayré, Fulbert (1936). Manual of Patrology and History of Theology (Volume 1). Paris: Society of St. John the Evangelist, Desclée & Co.
Fairweather, W. (1905). "The Greek Apologists of the Second Century". The Biblical World. 26 (2): 132–143. doi:10.1086/473625. JSTOR 10.2307/3141139. Grant, Robert M. (1955). "The Chronology of the Greek Apologists". Vigiliae Christianae. 9 (1): 25–33. doi:10.1163/157007255x00035. Harris, J. Rendel (1891). The Apology of Aristides on Behalf of the Christians. Cambridge: Cambridge University Press. Jurgens, William A. (1970). The Faith of the Early Fathers. Collegeville, MN: The Order of St. Benedict, Inc. (Liturgical Press). ISBN 978-0-81-460432-8. Milne, H.J.M. (1923). "A New Fragment of the Apology of Aristides". Journal of Theological Studies. 25: 73–77. O'Ceallaigh, G.C. (October 1958). ""Marcianus" Aristides, On the Worship of God". The Harvard Theological Review. 51 (4): 227–254. doi:10.1017/s0017816000028674. Palmer, D.W. (September 1983). "Atheism, Apologetic, and Negative Theology in the Greek Apologists of the Second Century". Vigiliae Christianae. 37 (3): 234–259. doi:10.1163/157007283x00098. Quasten, Johannes (1950). Patrology: Volume 1 – The Beginnings of Patristic Literature. Utrecht: Spectrum Publishers. Shepherd, Massey Hamilton, Jr. (January 1938). "The Early Apologists and Christian Worship". The Journal of Religion. 18 (1): 60–79. doi:10.1086/482092. Wolff, Robert Lee (October 1937). "The Apology of Aristides: A Re-Examination". The Harvard Theological Review. 30 (4): 233–247. doi:10.1017/s0017816000021453. Altaner, Berthold (1960). Patrology. New York: Herder and Herder.